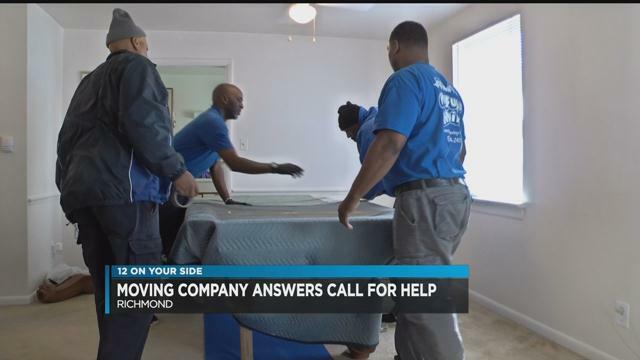 NBC 12 On Your Side aired a story regarding a woman with spina bifida, and within minutes of the broadcast, our local moving company franchise answered her call for help. Corinne Schill had agonized for almost a year over two pieces of furniture that she needed removed from her apartment – a large pool table and an old and heavy floor model TV. The professional movers from My Guys Moving & Storage arrived and moved heavy furniture so Corinne could make room for a hospital bed. The job was done in about 15 minutes. The movers showed up right on time on Thursday morning, assessed the challenge of the stairs and how to maneuver safely down from the second floor. The company’s chief administrative officer says she was moved by NBC12’s report and took immediate action. “Immediately after I heard the story, I called the owner David Tindall and I said, ‘Look we’ve got to get this done for her,’ and he said absolutely no problem. I said great because I’ve already left a message for Diane,” said Stephanie Kelley. Topping off a smooth move, the billiard table has a new home which is what Corinne was hoping for. It’s being relocated to the break room at My Guys Moving & Storage. “A lot of people don’t realize what these guys go through. They can move furniture for 10 hours straight and that’s a lot of strain on the body. So hopefully we can get that in their break room for them,” Kelly added. The complimentary move was sealed with a gift basket, gift cards and a hug. “Now I can have a hospital bed in my apartment and have home health care will be able to come in and take care of me when the time comes. It means absolutely the world to me,” said Corinne. Corinne says she’s in constant pain from spina bifida. She’s had many surgeries and another is inevitable. What My Guys Moving & Storage did for her helps her get ready for the next fight to keep her body moving.